The men and women of Treasure are sick, twisted individuals: again and again, they have managed to craft games that are incredibly compelling and forever demand just one more go, while remaining so horrifically hard that one starts to develop a captor-captive relationship with the fruits of the developers’ labours. Treasure, along with Cave, are probably responsible for more fits of puerile rage from people far too poorly adjusted to be playing these two companies’ masterworks; more irrational responses that lead to damage to control pads and arcade cabinets; more reported cases of Stockholm syndrome involving inanimate objects than any other in their field. Passé though it may be to make even the most fleetingly glancing reference to Fight Club in a public setting by now, Palahniuk had one thing right: the things we own can end up owning us. Treasure’s games bore their way into one’s head with their combination of sensational visuals and wonderful mechanics: Ikaruga is no departure from this lineage. Ikaruga is a game of black and white. 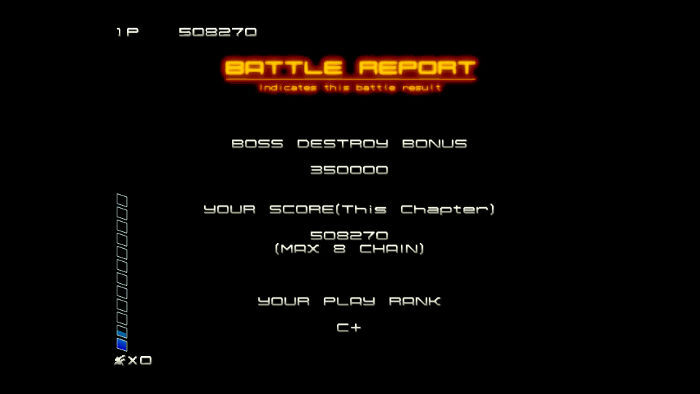 The immediately striking thing about Ikaruga following the brief introduction to gameplay mechanics that the prologue-like section that starts the game is its simplicity: not that this is alien to shooters such as Ikaruga, but play is handled through a fairly meagre selection of actions available to the player. Much as in Jamestown (or virtually any other modern shooter that does not provide me the opportunity to link to other content on this site), the game provides the player with the ability to move around to dodge incoming projectiles, shoot at enemies with what is a “conventional” weapon in-game, shoot at enemies with a special weapon and utilise some sort of defensive mechanism to delay the inevitable loss of a life. This symmetry of basic underlying mechanics in shmups may well be what puts people off them in the West: “it’s just another game about moving and shooting with a lot of bullets on the screen, isn’t it?” is a phrase that any fan of the genre will have heard from their friends when they end up raving about the latest release on whatever dead console that some plucky, invariably Japanese, developer has decided to produce a game for. Such people are without souls; such people should not be considered friends; such people should be compelled to sit down with Ikaruga and be shown that the genre has all of the depth as the most cerebral of strategy games. Love is no replacement for competence. 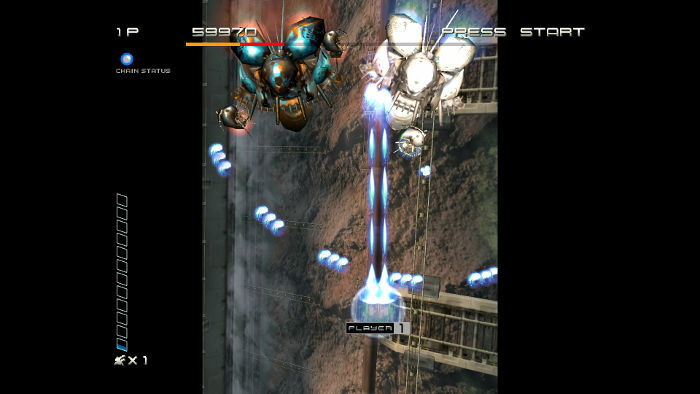 Ikaruga‘s depth lies in the very bounds that its simplicity places upon the player. 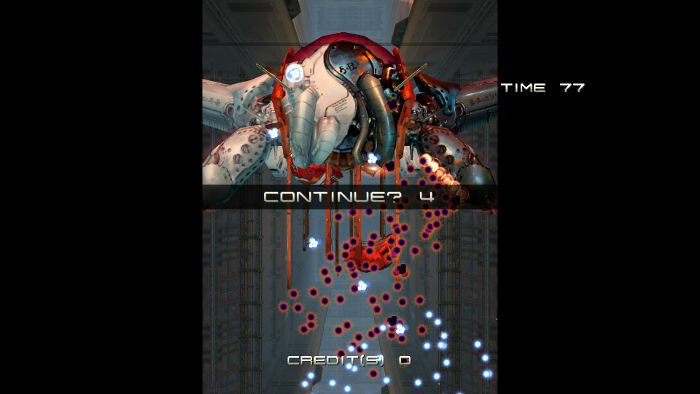 The game’s key differentiator from any other shooter lies in the way in which one can change the polarity of their ship: coloured white, and the player is invulnerable to anything white on the screen, be this bullets or enemies themselves; coloured black and anything dark ceases to be a threat. Any contact with enemy projectiles of the colour which the player has assumed will lead to the bar at the left of the screen filling up. This bar indicates the strength of the special attack of homing missiles that is unleashed with a nudge of the right trigger. Beyond the mere element of aiding survival that the ability to change polarity offers the player – it is rare that any wave of enemies will be of one colour – the availability of this special attack also serves to incentivise judicious use of the mechanic in order to better serve the challenging boss fights that punctuate the chapters. There is something so wonderfully satisfying about dodging around some white projectiles, absorbing some black ones only to predict a large onslaught of further white enemy fire, switch polarity and unleash the most powerful secondary attack. It is not just a case of the game being a series of disjointed risk-reward calculations, there is a flow to the game that feels natural, almost instinctive, that seems to be provided solely by the responsiveness of the player’s ship’s movement and how quickly one is able to change polarity. Game Over. Get used to it. Running out of continues only a couple of chapters into the game is no sad experience: it is an excuse to experience the attention-lavished visuals and enemy behaviour that the game offers right from the off. In spite of the core mechanic of the game being premised around only two colours forming the core of the palette, there is a surprising amount of variety on offer in enemy appearances, with the best occurring in the end of level bosses that tend to have light and dark elements thrown together to form a series of Frankenvessels with unique approaches to destroying the player and undermining the vast amount of concentration required to make any real progress in the game. Also worth mentioning are the lavishly detailed backgrounds that accompany the action: beautiful and complementary to the action without drawing focus away from the hail of bullets that defines the gameplay. Ikaruga manages to define both a console, in the Dreamcast’s fantastic selection of shooters, and a genre, in its deceivingly deep gameplay. A feast for both the eyes and the mind, it manages to draw in even the most reticent shmup fan with its stellar art, sound and gameplay design. In stacking the odds hideously against the player with the promise that all of the necessary tools to survive even the worst situations are provided – all helped by its wonderful control scheme – it manages to be both accessible and rewarding for the most obsessive player. Words are not enough to illustrate the brilliance of the game: seeing it in motion, holding the controller and seeing the ship move almost with prescience owing to the responsiveness of input – this is the only way to understand the level of artisanship that underscores the overall exceptional experience that Ikaruga is.